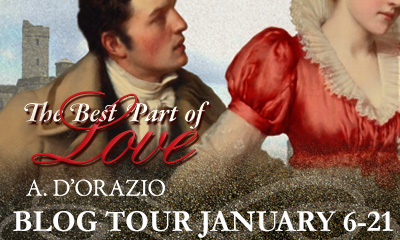 Today the blog tour for 'The Best Part of Love' by A. D'Orazio stops by. This story is 'Pride & Prejudice'-based but the variation is a big one, with Elizabeth having been married before, and to somebody of rank. I'll share the blurb with you first and then I will hand over to Amy D'Orazio for a vignette of something that happened during the story, but off-page. 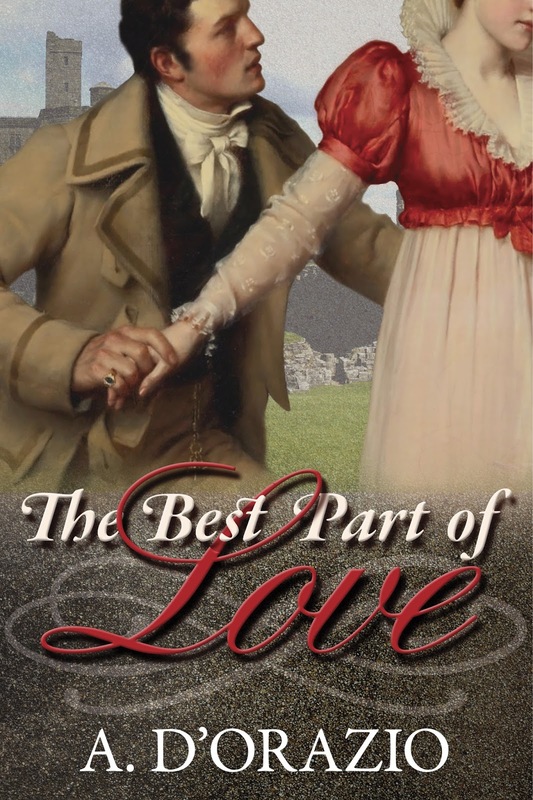 In most Austenesque tales, there is some sort of an argument between Darcy and Elizabeth which leads to Darcy’s recognition of his past errors and the change in his attitudes and perceptions. In this story, however, it is his aunt who takes him to task for his behavior in Hertfordshire. 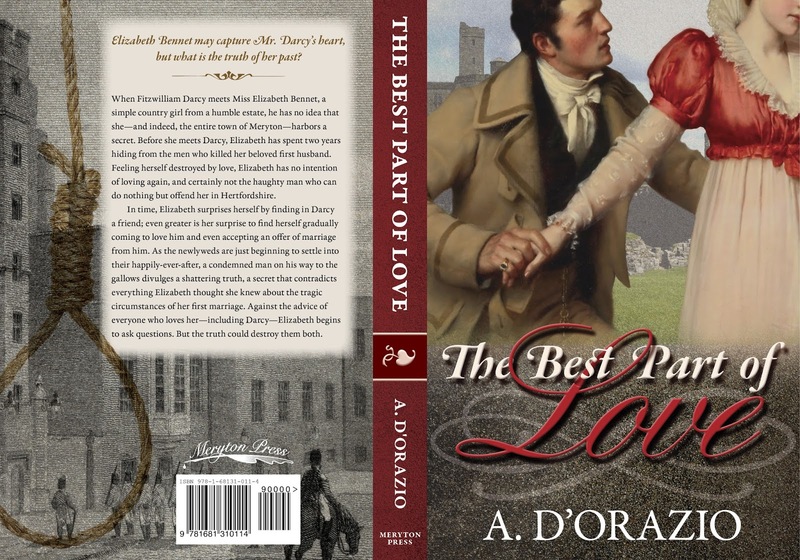 She has been hoping to create a match between Darcy and Elizabeth, only to find out from Elizabeth that it is quite impossible due to their past interactions in Meryton. Needless to say, she is quite displeased. This is a bit that didn’t make it into the actual story, but if it had, it would be at the beginning of chapter 11. She carefully took a seat beside him. She clasped her hands together in her lap and took a few deep breaths and at last began to speak. Saye began to chuckle, amused to see his cousin upbraided by his mother, but his mother shot him a look that would boil water, and he stopped. Seeing Darcy’s paper close by, he picked it up and buried himself behind it but Darcy knew well he was likely all attentiveness. Fitzwilliam, thinking he could be clandestine, muttered, “Said she was not handsome enough to tempt him ... refused to stand up with her.” Saye pulled the paper close to his face to silence his gasp of laughter. Uncertain what she already knew, Darcy confessed, reluctantly, to his ill-conceived and mad accusation of a liaison with her footman. Here Fitzwilliam spoke, a despicable look of innocent helpfulness on his face, “At least she cannot know that you thought the same of she and me, the night of Bingley’s ball. You may count on my discretion cousin, I assure you.” Fitzwilliam then sat there, complacent guilelessness gracing his countenance while Darcy shot him a murderous glare. Faced with such a recounting, Darcy felt the weight of his misconduct rather keenly. “I fear my suit might be rather unwelcome. “You cannot possibly think you love her,” Lady Matlock chastised him. “He does?” All three gentlemen exclaimed in astonishment. She waved her hand impatiently. “His lordship is a methodical man, and he wished to help our dear girl as best he could. In any case, we chose you. I want her to be a part of this family, and I am not about to have your poor behaviour in Hertfordshire stand in the way of that. The ebook is already available on Amazon, with a paperback due to follow in few weeks - Amazon US / UK. If you'd like to enter for a chance to win a copy of 'The Best Part of Love' please use the rafflecopter below. Readers may enter the drawing by tweeting once a day and daily commenting on a blog post that has a giveaway attached for the tour. Entrants should provide the name of the blog where they commented (which will be verified). Tweet and comment once daily to earn extra entries. Each winner will be randomly selected by Rafflecopter. Paperback or ebook format will be randomly selected for each winner as well. As you can see below, there are lots more blog stops to learn more about Amy D'Orazio, 'The Best Part of Love' and more chances to win a copy for yourself. Don't you just love Lady Matlock for this? It's a shame this scene hasn't made the final "cut" as it where, but I'll definitely remember it when I come to read this wonderful sounding book. The thought of her telling off not just Darcy, but her sons as well, brings a smile to my face. Go girl! Congratulation on your first published work, Amy! What an excellent vignette! I had to laugh in so many places. I love how Amy mixes humour with her angst. Thanks for welcoming her to your blog, Ceri. Best of luck conquering the ratings, Amy! Glad you enjoyed it Suzan. I completely agree with you, I love a bit of humour and it's good to mix it in to something more angsty to relieve the tension. Oh dear,Darcy does seem to be having a bad day! Not only is he severely admonished by Lady Matlock,he has witnesses to prove how foolish he has been and has no choice but to freely admit that,yes,he did act like a bumbling fool,intent on embarrassing Elizabeth and rousing her ire,but must also admit why he acted in such a fashion!! Dear me!! Don't you just love how determined Lady M is in her heartfelt desire to have Elizabeth join their family. Not only that,but she'll brook no argument and will see that he eats adequate amounts of humble pie in his attempts to apologise for the hurt he has caused Elizabeth! I loved this snapshot into how the high and mighty can be this humbled by their mistakes and taken to task by those that love them the most! Glad you enjoyed, Mary! It's nice to see these noble families acting like families sometimes rather than sitting round minding their manners all the time. It's good to see what direction different authors take the minor characters. I like to see Darcy's aunt ranged on Elizabeth's side. Glad you enjoyed it, Patty! Such a shame this is not in the book as I loved it! Poor Darcy, how on earth is he going to make amends for all his insults? I look forward to reading this book. Thanks for the giveaway. It's good to be able to bring you an excerpt but I have been very lucky this time and got something additional to what was in the book. I agree with you, a very entertaining scene! Well as usual I can't enter on the Rafflecopter! I don't think it likes my phone as i never get the form to enter a blog dote or even to try. In future I will only enter those giveaways that just require a comment and do not involve Rafflecopter but thanks anyway. I remember that scene from the first time I read this. What a gem! Congrats on the book birthday! It's such a great scene, isn't it! I'm looking forward to reading this book, such an interesting premise. Thanks for the giveaway. Congratulations on the book release. I should probably clarify ... MP didn't actually cut this, it was a scene that my commenters at AHA (lovely people of which you are one Monica!) asked me for while I was posting. It wasn't ever in the original but everyone wanted to know what she said! :) Its why I love posting, sometimes you just never know what "behind the scenes" people will want to see! This is one of the things which is so great about posting on the WIP comments threads on sites like AHA. It's such a great opportunity to ask the author of the story you are enjoying all the little questions that you have. Great blurb. I can't wait to read more. Thanks for the giveaway. I love seeing Darcy upbraided by his aunt, especially when he's wrong! Thank you for sharing a funny scene with us. Thank you Maria! Sorry your comment vanished! Oys, yes, that was fun to get the extra scene. I remember where this was in the story and was curious about Darcy being taken to task by his aunt. Love that she and her sons are all present with Darcy. This was a great book all around. So glad you enjoyed it, Daniela! Love the excerpt. I am all the more intrigued! Thanks for your comment, Becky. I hope you enjoy the book when you read it. I was happy to be able to share the excerpt. Thanks for your comment, Jen! Love this book but need to read the published version. I did post my review on Goodreads after reading the unpublished story on AHA. I want to read it again to see if there are any changes which make it even better. Thank you Sheila! The wonderful people at Meryton Press really did an amazing job with it! One sort of funny change ... the dog I originally had in BPL was a Jack Russell Terrier named Trump as a nod to the first JRT ever bred. No matter what your political leanings, releasing a book THIS January with a dog named Trump felt... awkward, so the dogs name is different now! Loved the excerpt! Can't wait to read the entire book. I hope you enjoy the book when you read it, Joan. Thanks for stopping by and commenting. Delightful vignette! Well I'm sure Lady Courtney will make him work for it! Thank you for the chance to win! When will the paperback be available? Thank you so much Carole! The paperback will be available in about 2 weeks! Hi Carole. I'm glad you enjoyed the vignette, hope you get to read this one soon! Thanks for the vignette, I love Lady Matlock! She's surely knows how to put Darcy in his place while giving him some loving guidance. And he certainly needs it, doesn't he! I wonder how much it would have affected Darcy's behaviour, not having parents still living. I know he implies in P&P that his parents were a bit overly proud, but they would have probably been very keen that he didn't get taken in by an unsuitable female at a young age so maybe they would have encouraged him to soften his manners later on. Who knows, eh! I hope you enjoy finding out the secret when you read it, Erika! Wow, I am thrilled to have won a paperback copy. 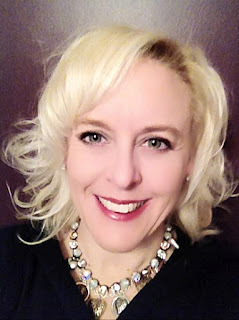 I am such a fan of Amy's - reading all of her stories as I have found them on AHA. Now it will be easier for me to share the story with others. Thanks you ever so much and congratulations to the other winners.